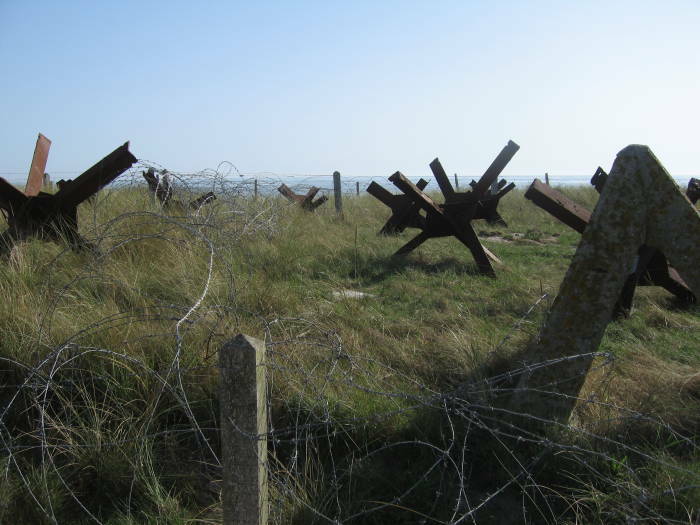 We're visiting the landing beaches and battlefields from the D-Day landings of June 6, 1944. 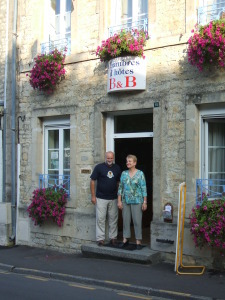 We have been in Sainte-Mère-Église after flying to Brussels, renting a car, and driving across Belgium and France. 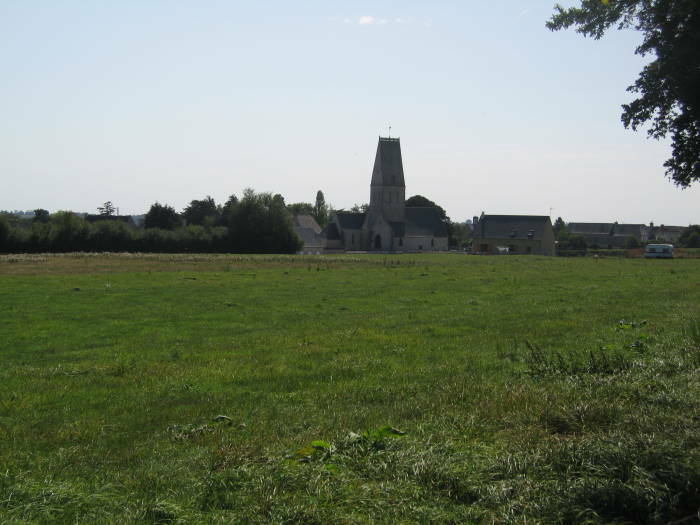 We have explored the area around Sainte-Mère-Église and been on Utah Beach. 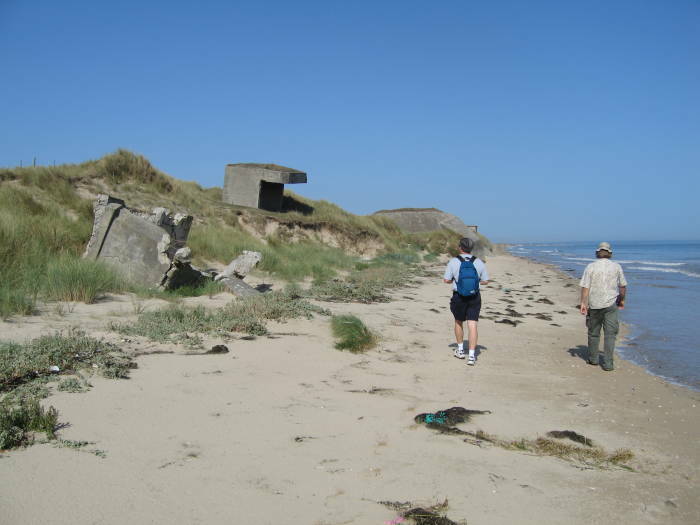 Now we are going to walk along the beach and then inland, following the route taken by some of the U.S. forces. Below is a U.S. military map from "Cross-Channel Attack" showing Sainte-Mère-Église near the left margin, Utah Beach at right, and the movements of units of the 4th Infantry Division. Our plan is for a trek of about 20 kilometers. 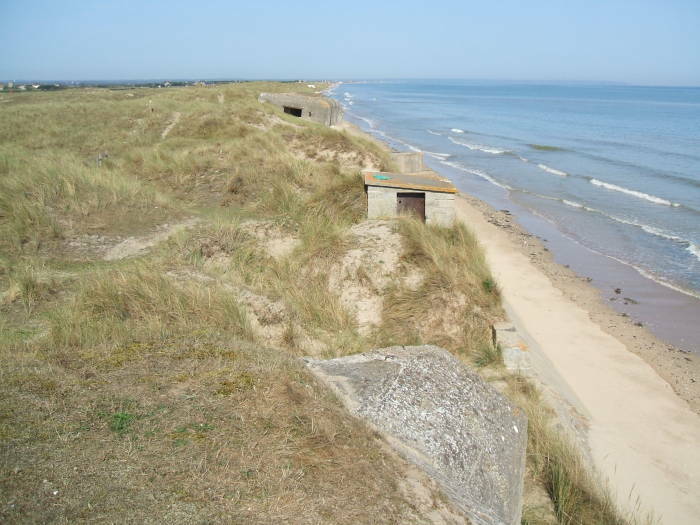 First north along Utah Beach, then turning inland to parallel the path followed by the 1st and 2nd Battalions, 22nd Regiment, 4th Infantry Division. Then continuing to Sainte-Mère-Église. 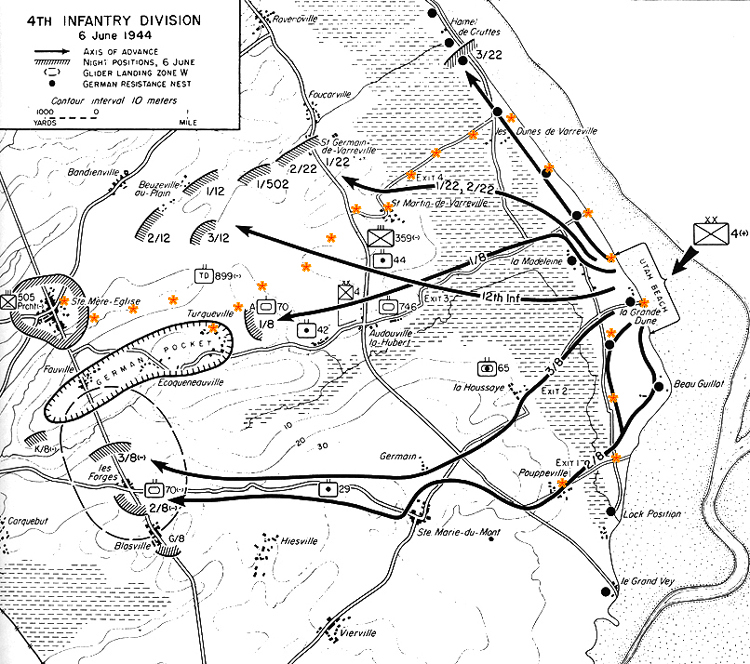 U.S. military map of Utah Beach and Sainte-Mère-Église, our path shown in orange stars. As for the locations shown on this map, we would start at Pouppeville. From there we would follow a bridle pate through today's nature preserve to la Grande Dune, where the Utah Beach museum is now located. North from there along the beach to les Dune de Varreville, where we would leave the beach in the direction of Exit 4. Then through St Martin de Varreville, and from there to Turqueville. Then on into Sainte-Mère-Église. Much of this route follows a French national hiking route. We will be on a mix of beach, small roads, and lanes and paths used by farmers. Before starting this grand plan, we would have to get to the start of our trek. 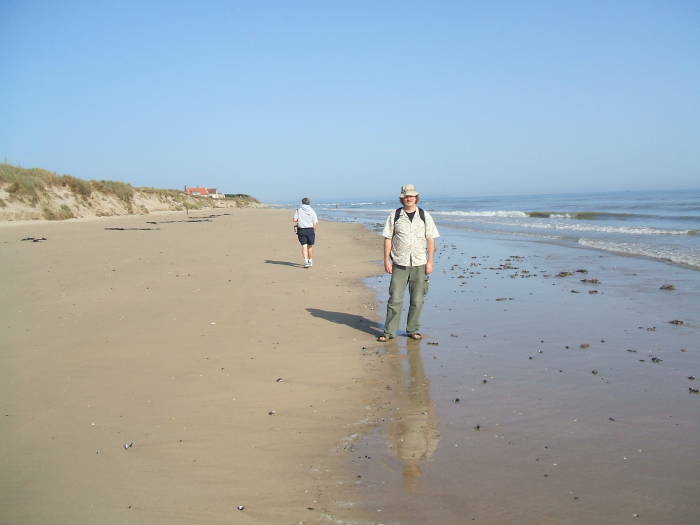 We didn't want to walk all the way to Utah Beach, along it for six kilometers or so, and then all the way back again. So we enlisted the help of our innkeeper. Maybe he could drive us over to Poupeville in our van and drop us there tomorrow morning. That seemed simple enough, but it was complicated by my sketchy French. Monsieur Berot was a little reluctant at first, but then I realized that he thought we wanted to hire him as a chauffeur and tour guide for the entire day. Well, it may have been my sketchy French compounded by the oddity of our scheme. Yes, Poupeville. Yes, we realize that there's nothing to see in Poupeville. And yes, we really want you to just ditch us there and drive our van back here to Sainte-Mère-Église. 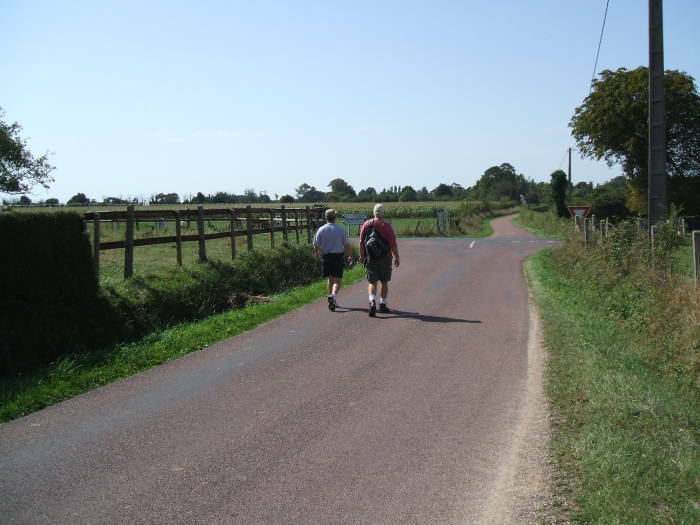 Yes, we're going to walk back from Poupeville. Really. It suddenly made much more sense to him when I happened to mention that we would be following la Grande Randonneé. 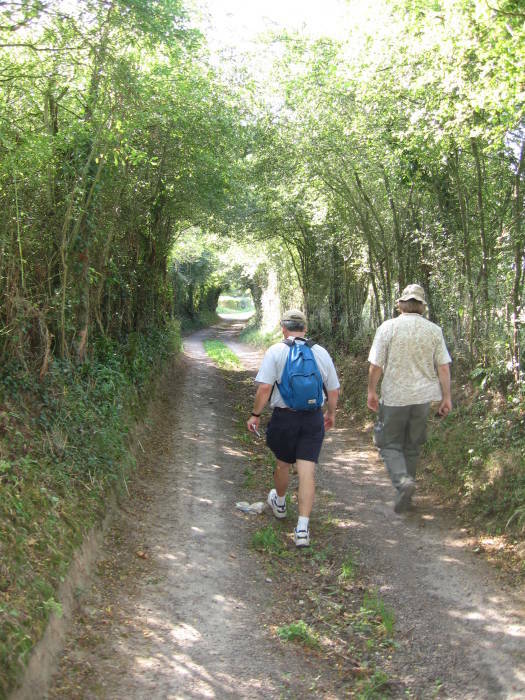 France has a lot of "Great Paths", long-distance hiking trails. We would be following GR 223 for almost all of our planned hike. Now that made sense. We got breakfast the next morning at the tabac down at the corner, then came back and got Monsieur Berot. Off to Poupeville! He laughed as we pulled into Poupeville, made a sort of grand gesture, and announced our arrival. No, there isn't much there. The idea of spending the day in Poupeville and then walking back does sound silly. But instead he let us out there and drove our van back to Sainte-Mère-Église. We walked a kilometer east to join Grande Randonneé 223. 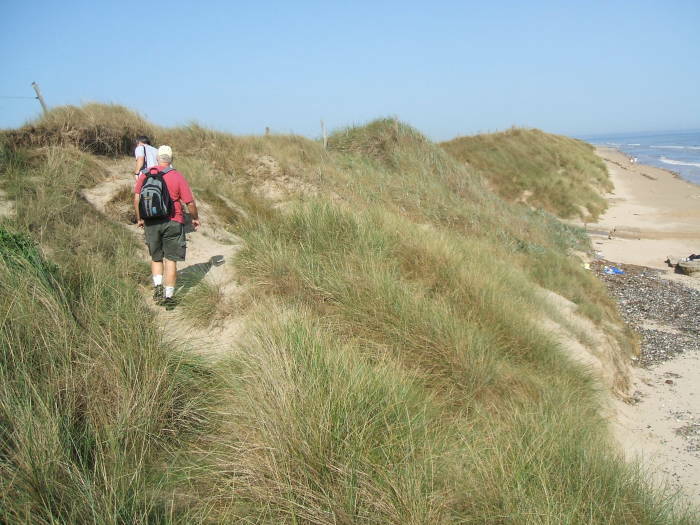 GR 223 would be the path of choice for multi-day D-Day hiking — it starts in Bayeux, goes to the coast and follows Omaha Beach, loops back inland to get around the Douve estuary, then continues north along Utah Beach, through Sainte-Mère-Église and then on north toward Cherbourg. We joined GR 223 on the small D 239 lane, along the edge of the Beauguillot nature preserve. 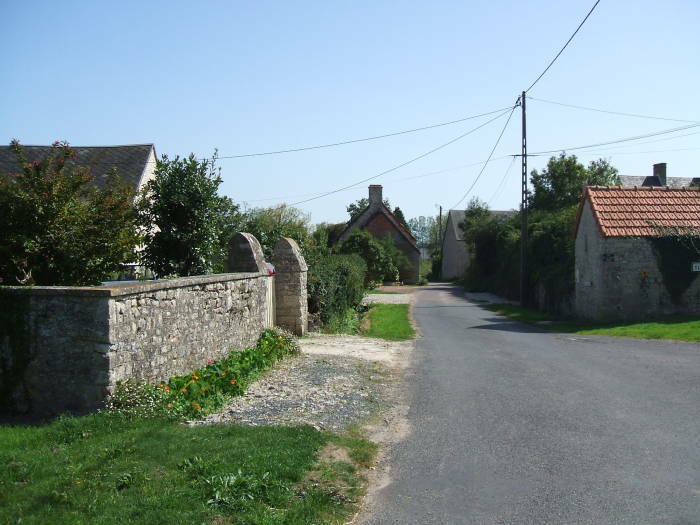 It's about three kilometers due north along that to the Musée du Débarquement, the Landing Museum, near the village of la Madeleine. From there we walked north along the beach, either on the beach itself or along some paths along the dune just along its upper edge. 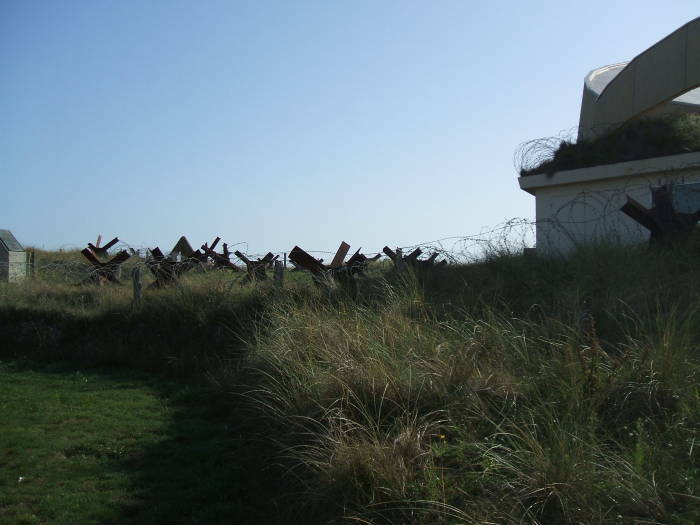 Museum bunker and obstacles at the south end of Utah Beach. Bob at the waterline as Tim walks north. Beach obstacles: Steel 3-beam "jacks" and a reinforced concrete pyramid. 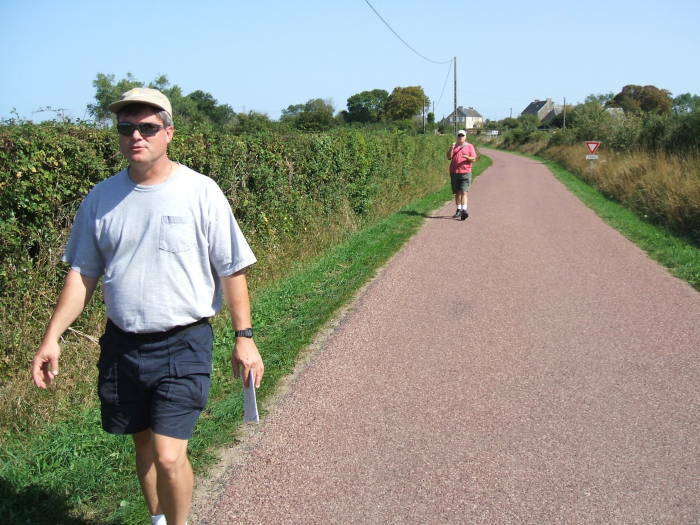 Tim and Jeff walk up Dune d'Audouville. 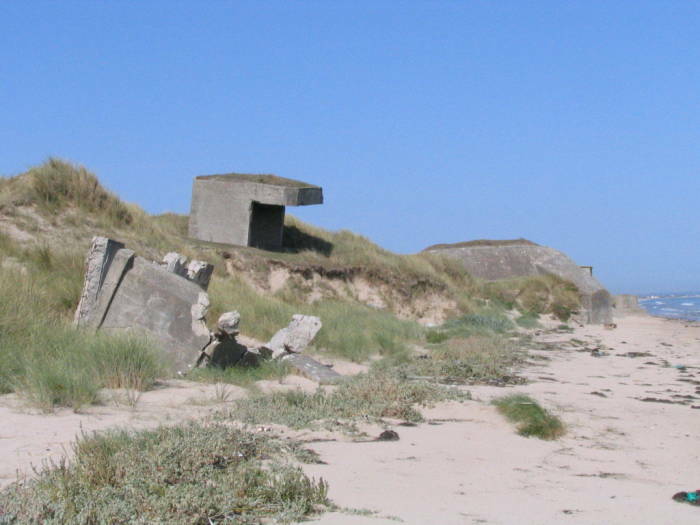 The Wn8 cluster of bunkers. Tim and Bob approach the Wn8 cluster of bunkers. Looking north from Wn8 toward the StP9 bunker site. 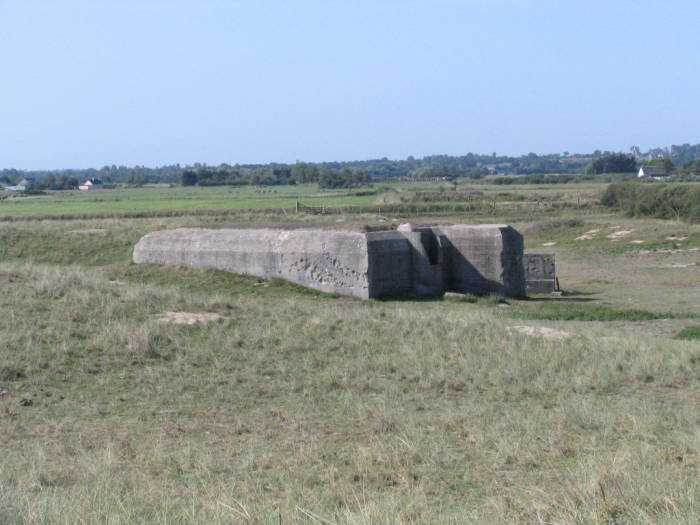 The blockhouse just behind the dune at les Hougues. 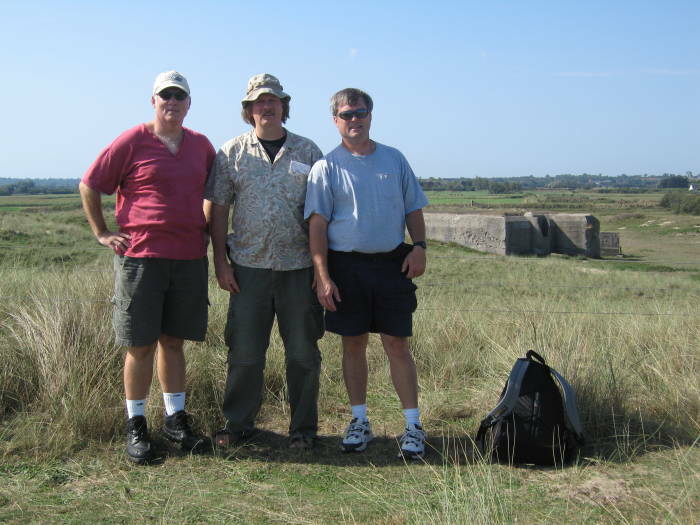 (L-R): Jeff, Bob, and Tim on Dune d'Audouville near Les Hougues. You're looking inland toward the blockhouse and on in the direction of Sainte-Mère-Église. Just north of les Hougues you come to a monument — a tall enscribed column with a tank and another armored vehicle. GR 223 turns inland there, to follow the D 421 road south for maybe 200 meters and then turn off that to the west on a small lane. You really need a good map like the IGN #1331E, where you get to see things down to the level of fencelines and buildings. The GR 223 doesn't have trail markers, at least not through this section. You have to figure out where it goes. The GR 223 mostly uses existing lanes, but they can be pretty minor like the one you see here. 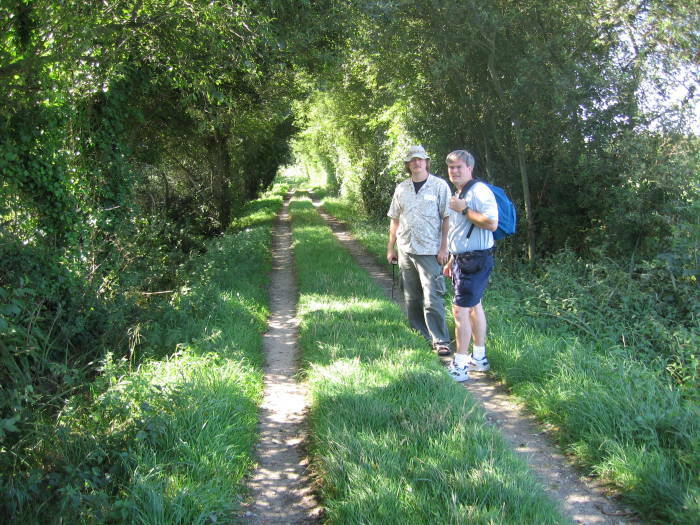 The first two or three kilometers of the path after leaving the beach was mostly along farm tracks, as seen in this section near les Sablons. 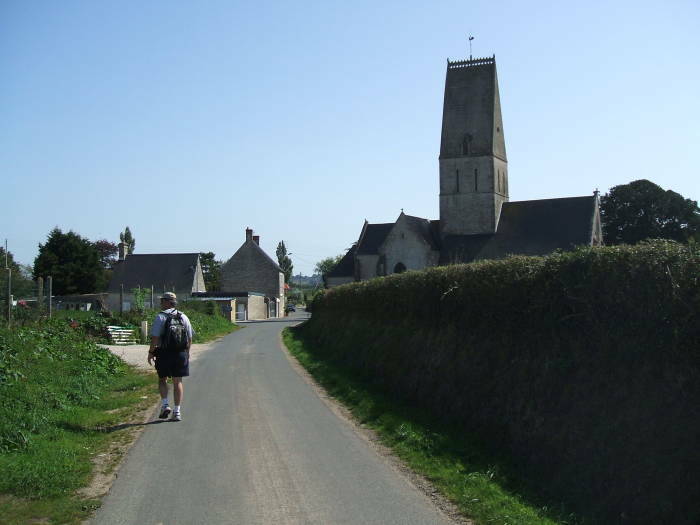 It was like this until we reached the village of St Martin de Varreville, where it went back to following small paved roads. Bob and Tim on the GR 223, past les Sablons. The roads throughout this area are all named for men killed during the fighting. These memorials to their liberators are carefully maintained. Even that two-track path above is known as Chausse Gaudet. 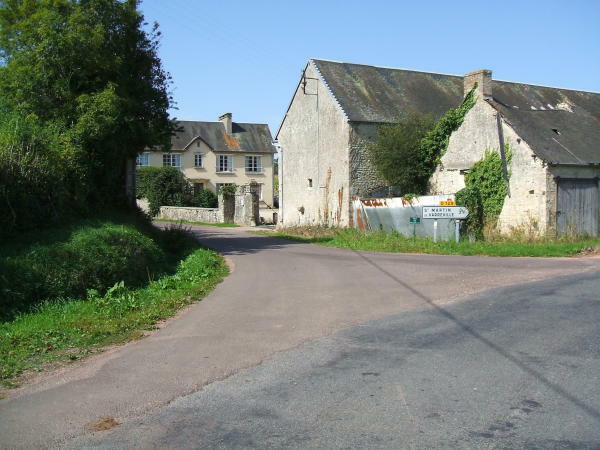 Criss Road, seen above, is a one-kilometer section of the D 423 just east of St Martin de Varreville. There's a site of some historical significance known by the arbitrary military label of Site WXYZ. 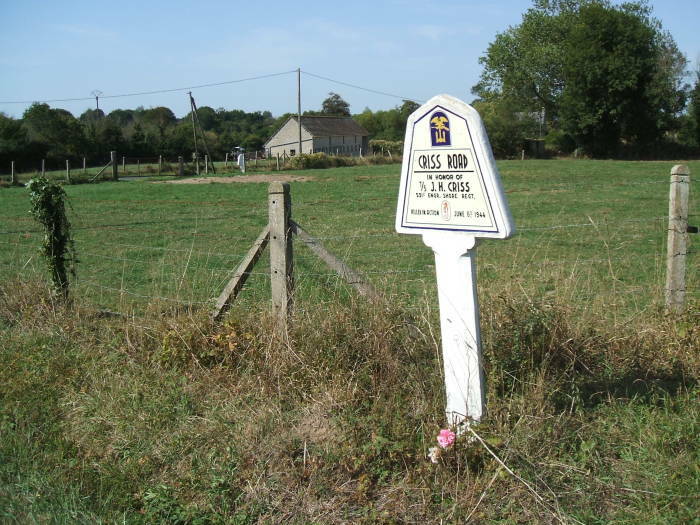 It's along the D 423 road along the somewhat scattered settlement of les Mézières. We looked, but there isn't a lot to see at WXYZ, or at least we didn't know enough details at the time to get much out of what little we could see. Back onto small roads, Tim and Jeff continue west. 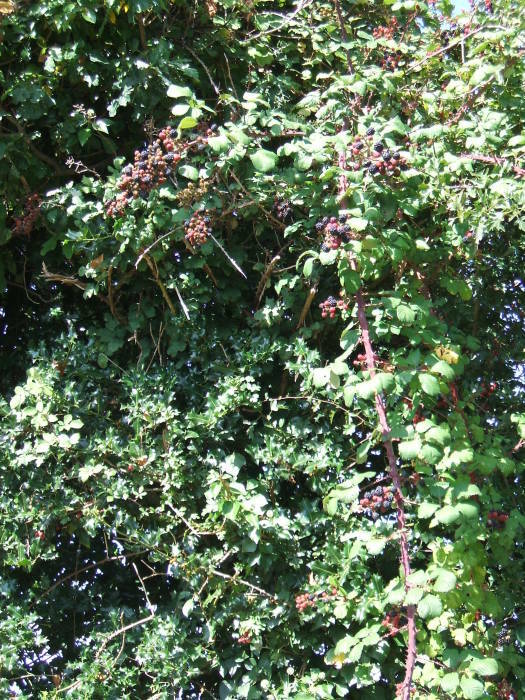 A lot of the hedgerows are covered with wild blackberry bushes. If you visit in September, as we did, they provide readily available snacks to maintain your energy. Relatively low hedgerows covered in blackberry bushes. Approaching the village of Turqville. Entering the village of Turqville. We passed through the settlement of St Martin and the village of Reuville. From St Martin the GR 223 turns south and passes through the village of Turqville. Then it angles back north on increasingly smaller lanes until the last kilometer or two is back to being a chausse or track through the countryside. We had covered a little over 20 kilometers, but it was just mid-afternoon. So, we cleaned up and then headed back out to see more things in the area!